I wanted to be able to quickly show the Windows Updates on a server. This came about during a discussion about auditing. Of course, there is no point in re-inventing the wheel so I had a quick Google and found a couple of posts on from Hey Scripting Guy blog and one from Tim Minter. Neither quite did what I wanted so I modified them as follows. 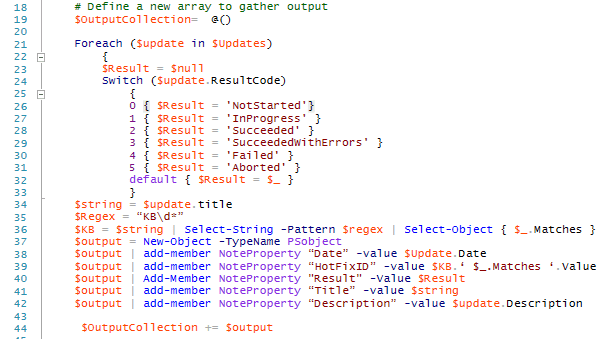 this transforms the ResultCode Property to something meaningful and places the KB in its own column. I have created a function called Show-WindowsUpdatesLocal It’s Local because doing it for a remote server takes a different approach but I will show that another day. 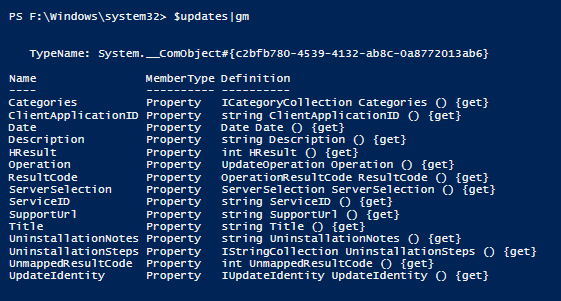 This entry was posted in PowerShell, Uncategorised and tagged automation, Powershell, Server Admin, Windows Updates, WSUS. Bookmark the permalink.